The Kagyu (Wylie transliteration: Bka’-brgyud) school, also known as the «Oral Lineage» and «the Spotless Practice Lineage» school, is one of four major schools of Tibetan Buddhism, the other three being Nyingma (Rnying-ma), Sakya (Sa-skya), and Gelug (Dge-lugs). The Kagyu school traces its origins to the teachings of the Indian mystics Tilopa (988-1089) and Naropa (1016-1100), whose lineage was transmitted in Tibet by the great translator Marpa (1012-1097). He took over the mahamudra («great seal») transmission lineage from Naropa. Moreover Marpa studied with the Indian Masters Maitripa and Kukuripa. On his third journey to India he met Atiśa (982-1054) and studied the teachings of the Kadampa masters (both Kagyu and Gelug schools trace their roots to the earlier Kadampa school). Marpa spent 17 years in India and is known as one of the great translators of the second translation period. Marpa’s principal disciple was Milarepa (Mi-la-ras-pa) (1052-1135), arguably one of Tibet’s great religious poets and meditators. Among Milarepa’s many students were Gampopa (Sgam-po-pa) (1079-1153) — a great scholar who can be recognized as the real founder of Kagyu as a distinct school of Tibetan Buddhism — and Rechung Dorje Drakpa, also known as Rechungpa. 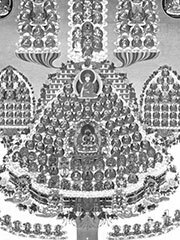 Following Gampopa’s teachings, there evolved the so-called «Four Major» schools, and from Gampopa’s disciple Phagmogrupa the «Eight Minor» lineages of the Kagyu School. Drukpa Kagyu, which combined lineages from both Gampopa and Rechungpa, is the state religion of Bhutan, giving the country the name Druk Yul. Drukpa monasteries are also found in Ladakh, Zanskar, Lahoul, Kinnaur, Spiti, and other parts of the Himalayas. The organization into four major schools and eight minor schools, while traditional, is not always helpful in understanding the history or influence of the schools. For instance, the very first Kagyu school, the Shangpa Kagyu, predates Gompopa and thus is outside the framework. Another school is the Rechung Kagyud, founded by Gompopa’s peer, Rechung Dorje Drakpa. The only schools with any significant following today are the Karma Kagyu, Drukpa, Drigung, and Taklung schools. It is through these four stages of development that the practitioner is said to attain the perfect realization of Mahamudra. Important practices in all kagyu-schools are the tantric practices of chakrasamvara and vajravarahi.